Toshiba's been lagging in the race to raise storage capacity in solid-state drives, but has taken a step forward with its new 7.68TB ZD6000 SSD. The new drive is the highest-capacity SSD announced by Toshiba to date, up from its prior high of 4TB. But it's still way behind Samsung, which started shipping a 15.36TB SSD earlier this year. The ZD6000 is exactly half the size of Samsung's highest capacity drive, but Toshiba could exceed 8TB soon. It's a matter of cramming more chips in a drive, and Toshiba has the manufacturing technology to make that possible. Toshiba's newest SSD is targeted at enterprises, which use high-endurance drives to store long-term data, like movies that are streamed from data centers to client devices. Enterprise SSDs are also used as cache, or temporary storage, where data is lined up for processing in a computer. 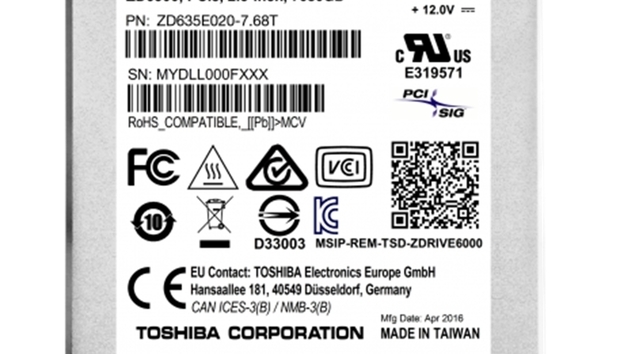 The ZD6000 SSDs also come in capacities starting at 800GB, but Toshiba could not immediately provide prices or availability information, saying it would come at a later date. But enterprises SSDs are expensive because they have longer life, speed and durability than consumer SSDs. The mean time between failure of drives is 2 million hours, Toshiba claims. The 7.68TB SSD is a standard 2.5-inch drive that fits into NVMe storage slots based on PCI-Express 3.0. Toshiba is targeting the ZD6000 line at flash storage arrays in data centers. With storage software from DataDirect Networks, the SSD storage layers can be virtualized to squeeze out the best performance from flash arrays. A software-based I/O layer can buffer data so the SSDs can act as speedy cache, which will help run applications like databases faster. SSDs based on NVMe are typically faster than drives based on the SATA storage interface, which are in most PCs and servers today.